Now that it’s getting cool, even in relatively mild Austin, I figure it’s time to go back to Hawaii. I was certain that I posted a photo similar to this in the past, and I was right. Back in August 2016, I featured a different catamaran on Waikiki Beach. Unlike that one two years ago, my family and I actually got on this one. I made a snap with my Canon G7X Mark II, before we boarded. 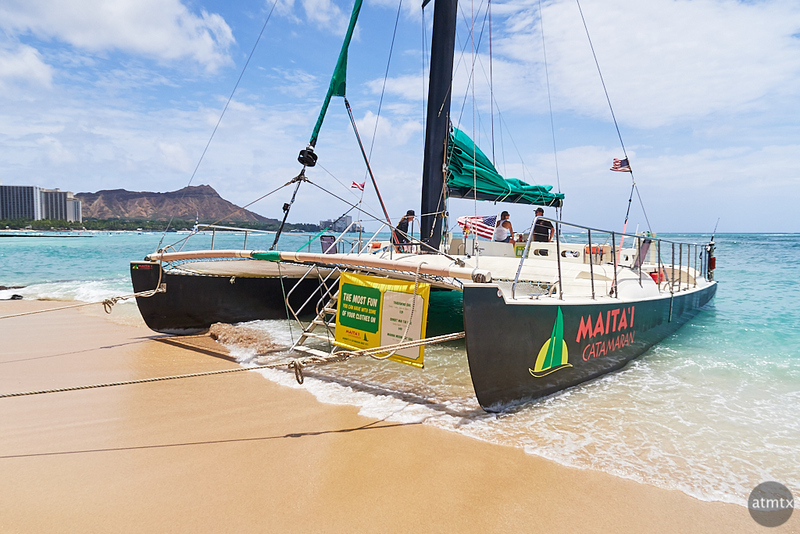 We try to go to Hawaii every couple of years and the hour and a half catamaran ride is aways one of our favorite activities. Two years ago, instead of the Maita’i, we picked a newer one. It was a beautiful catamaran with a smooth ride, except the my boys were disappointed. They like the faster and more splashier experience. This year’s Maita’i cruise did not disappoint. There was great wave action and the folks in the front were soaked. My boys lead the charge, facing the waves head on. Never sailed on a catamaran, so please excise a dumb question. Do they keep both hulls in the water at all times? Or sail close to the wind for the thrill of it with one hull in, one airborne? Well, if the catamaran is part of the America’s Cup racing team, then you can have a hull out of the water. For this tourist cruise, it’s both hulls planted safely. Only a bit of splashing water.